Heavyweight for maximum strength and durability. Closed on three sides to secure the safety of your documents. No sheet punching necessary, keeping inserts in original condition. The product is fantastic! It is the only one of its kind I use. I wish it was available in more retail stores. The last store in this county that sold the product was forced to close due to 'big box' store competition and the 'big box' stores refuse to sell the product. My only 'con' is that the order came in a huge box and the way it was packaged caused the sheet covers to be dented. I think that will come out with time, but better packaging would have been preferred. 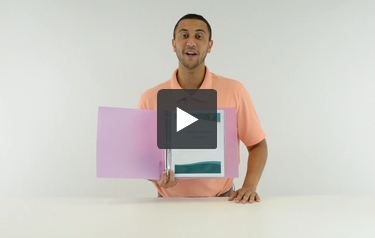 Hi, I'm Griffin at C-Line and today we're going to talk about our super heavyweight vinyl sheet protectors. The sheet protectors are made from super heavyweight vinyl, and provide maximum durability for your documents and reference materials. The heavy feel and rigid construction make your presentations, letters, and reports stand out. The top loading design eliminates the need for hole punching, and allows you to easily add or remove pages without taking the sheet protector out of the binder. Plus, the clean 3-hole punch and uniquely shaped corners make loading and turning pages quick and easy. The clear finish on these sheet protectors offers a sharp, transparent view of the contents, and makes them ideal for showcasing presentations and documents. They are packaged in an easy open, reclosable box, which is handy for storage, and keeps them clean and protected. 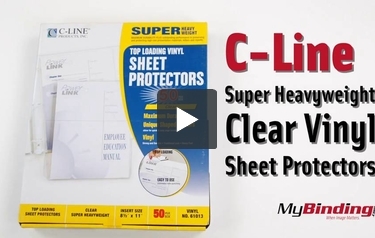 C-Lines' super heavyweight sheet protectors store and protect documents in their original condition. They are great for organizing your home, school, and business. Order yours now! That's all we have for today, I'm Griffin at C-Line and thanks for watching. Transcript: Welcome to MyBinding.com. These are the Super Heavyweight Clear Vinyl Sheet Protectors from C-Line. These sheet protectors are the pinnacle of document protection. High quality vinyl and superior manufacturing guarantee long lasting document protection. No sticking, print transfer or document degradation. These protectors feature low reflectivity to give you crystal clear viewing. The binding edge is 3 hole punched for standard binders, and the unique corner shape helps with turning. They give your documents a heavy, professional feel and permanent archival quality protection. Welcome to MyBinding.com. These are the Super Heavyweight Clear Vinyl Sheet Protectors from C-Line.